Others lavished praise on Chinese striker Wu Lei, who outgunned a legion of foreign hotshots to finish as the league's leading scorer with a tally of 27. Those who know SIPG's history, however, would argue that it is the so-called "godfather of Shanghai soccer", Xu Genbao, who deserves the most credit. Without Xu, SIPG would simply not exist, while Wu's talent could easily have gone untapped. The story begins at the turn of the century. "When I was competing in the Asian Cup in 1999, I saw many talented players in the Japanese team and realized that China needed to have soccer stars of their own. That's why I decided to set up my own academy in China," explained Xu, a former national team captain, at a recent forum organized by Shanghai University of Sport, Jiefang Daily and the Sports Bureau of Shanghai. Inspired by English giant Manchester United's famed academy, Xu borrowed 23 million yuan (around $3.2 million at today's rates) from a bank and invested 33 million yuan to build a training center on Chongming Island, located north of downtown Shanghai. "You needed 1.5 million yuan to buy a house in 2000. Thirty-three million was a lot, but I never thought about the returns," he said. Despite its secluded location, the five-hectare Genbao Soccer Base received about 2,000 applications when it opened for business in 2000. Ninety-six kids, ranging from 9 to 12 years old, were selected as the first batch of trainees. Three years into its existence, Genbao teams finished first and second at the 2003 Shanghai Under-15 Soccer Championship. In 2009, a team from the academy representing Shanghai won a prestigious National Games title. But Xu's ultimate goal was for the school's best players to compete at the very highest level in China. So, in 2006, he founded a new professional club, Shanghai East Asia. The club started out in the third tier, China League Two, and won promotion to League One in 2008. Off the pitch, however, trouble was brewing. Xu was struggling to pay 200,000 yuan in monthly loan repayments, not to mention the salaries of 40 employees and the 20,000 yuan worth of living subsidies for each trainee. To balance the books, Xu was forced to trade several of his top players in 2010. Two years later, though, Xu's charges hit the jackpot, winning promotion to the CSL before being bought by the Shanghai International Port (Group) Co. As a result, the team was renamed Shanghai SIPG. To this day, many SIPG players come from Xu's acclaimed academy, including Team China star Wu-who has lit up this month's Asian Cup in the United Arab Emirates-and club captain Wang Shenchao. 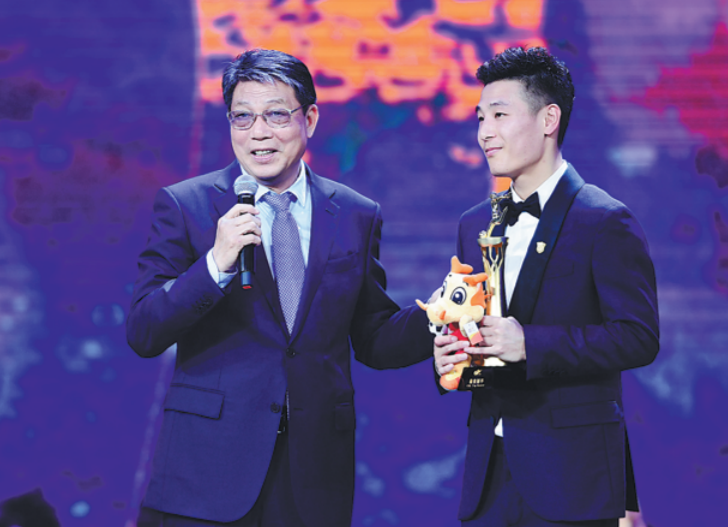 "Winning the CSL has been our greatest achievement of the past 18 years," said the 30-year-old Wang at the forum. "When we won the title, what first came to mind were the happiness and tears that the players shared while training together at the academy. Our struggles had finally paid off." Xu admitted that there were plenty of tough times back then, recalling how Lyu Wenjun, who now plays as a winger for SIPG, was once so upset that he attempted to escape the island. Lyu's bid for freedom failed because the mainland was only accessible by ferry. "It was not easy for those kids to stay on a desolate island for such a long time," Xu said. "They thoroughly deserve the success they have achieved today." SIPG centerback Cai Huikang, who was also at the forum, admitted Xu was a stern taskmaster, who demanded the highest standards. "I did not understand director Xu's criticisms about how my training was not to his expectations. But after growing up, I realized that the skills he taught me were very beneficial," said Cai. Despite the progress made, Xu is under no illusions that China has a lot more work to do to close the gap to the world's elite. "Youth training should still be the main focus. We need to bring in more professionals and talents to the academy to raise the standard of Chinese soccer," he said. "Our academy now has some talented players, but our country's level of soccer still needs to improve. I believe our players can break out of Asia one day."